SMALL 10 x 13.5 in. (255 x 344 mm) 12 x 16.2 in. (393 x 530 mm) 19 x 24 in. Green Arya Tara sits gracefully upon her moon disc, lotus seat and enlightenment throne in her traditional posture of royal ease. She has the youthful body of a sixteen-year-old, a sweetly smiling face, and all of her silk garments and jewel ornaments are meticulously painted. The minute form of Amoghasiddhi Buddha, barely larger than the pupil of her eye, crowns the top of her tiara's central jewel. The serpent-devouring face of kirtimukha is embellished on her neck choker, and a tiny square pendant bearing her own minute form hangs from a filigree chain between her breasts. Each decorative element of her jewellery is individually shaded, with a skilful use of background shadows creating a vivid impression of luminosity upon her pearls and finely embossed metal ornaments. 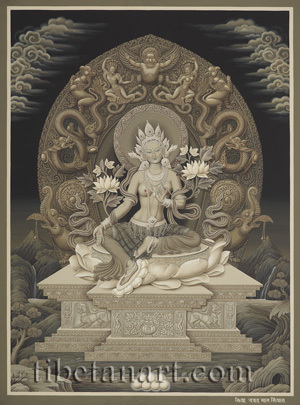 All the lotus petals in this composition are shaded to imitate their natural texture, with the streak shading on the irregular petals of Tara's lotus seat evoking the soft convolution of each petal. And a contrasting brightness is given to her two upper lotus blossoms, which stand out vividly against the dark background of her aura. The three-dimensional effect of her lotus seat and foot pedestal are further enhanced by the receding perspective on the flat top of her lion-throne, which is elaborately decorated to resemble the chiselled relief of carved stone or embossed silver. The central panel of her lion-throne shows the relief of a longevity vase full of amrita or nectar, which is sealed with the scrolling tendrils of a wish-granting vine. On either side of this vase are vertical panels that show the forms of two dancing goddesses, who each grasp the branch of a wish-granting tree with their upraised hands. Enhanced by shadows the throne's outer facade displays the symmetrical forms of the paired lions that guard each of the four sides of her throne, collectively representing the 'Eight Close Sons' or great bodhisattvas. In the panels on either side of these jewelled lions are the symmetrical forms of standing garudas, each of which devours a pair of entwined serpents. The plinth and lower steps of her throne are embellished with symmetrical pearl, scrolling tendril, lotus flower and petal motifs. The upper cornices are similarly decorated with rows of pearls and petals, with the scrolling roundels of its central cornice containing small images of swans, elephants and a deer. A ring of pearls and scrolling motifs encircles Tara's halo, and behind her back ascends her elaborate torana or enlightenment throne, the design of which is based upon the magnificent gilded 17th century 'Golden Gate' of Bhaktapur's Durbar Square in the Kathmandu Valley. The figure of a garuda with outstretched wings and arms crowns this torana, with his talons grasping the coils of a naga and nagini. Both of these male and female naga-serpents appear in human form, with their long serpentine tails extending from the base of their spines. And each is crowned with a canopy of five small serpents, which represent the five different castes of these guardians of the underworld. Below the naga and nagini are jewel-grasping dragons, and above the coils of each dragon is a rearing griffin or garuda-lion. Two ferocious makaras or crocodiles guard the base of the torana, with their jewelled and blade-like tongues supporting hanging bells. The swirling tail of each makara spirals upwards into an elaborate roundel that merges with the complex scrolling background of the torana, which is embellished on its outer edge by a separate frieze, and on its inner edge by the ring of pearls that defines the shape of her aura. The eyes of all the mythical creatures upon her throne and torana are depicted without pupils to emphasize the effect of hammered metal or carved stone. The dark background landscape of this painting depicts billowing clouds, mountains, trees, rocks and waterfalls. Below Tara's throne appears an offering of seven jewels, which represent the seven possessions of a chakravartin or 'universal monarch'. This exquisite composition of Green Tara was painted by Devendra Man Sinkhwal in 2005, and took almost five months to complete, with only black, white and yellow-ochre pigments being used to create its vivid three-dimensional effect and sepia tonality.